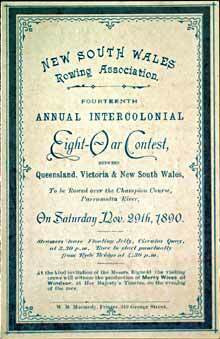 New South Wales Rowing Association. On Saturday Nov. 29th, 1890.
from Ryde Bridge at 4.30 p.m.
on the evening of the race. 1st VIC – Bow: W Hatch, 2: C Poynter, 3: F G Payne, 4: Arthus G Jenkins, 5: F James, 6: William Watson, 7: C S Cunningham, Str: R B "Bob" Nicolson, Cox: V Petherick, Emerg: W Robb, Cch: Walter Bray. Average weight 11st 4lb. 2nd QLD – Bow: F W de Little, 2: W E Molle, 3: H T Bell, 4: F M Armstrong, 5: Arthur H G Drury, 6: Colin B P Bell, 7: E Colclough, Str: W A D Bell, Cox: F Slawson, Cch: Joshua T Bell. ( In Referee 26 Nov 1891, the coach in Sydney was repoprted as being the six man, Colin Bell.) Average weight 11st 8lb. 3rd NSW – Bow: A E Hopgood, 2: J Murray, 3: J A Read, 4: F A Styche, 5: W Moore, 6: Louis J O’Rourke, 7: John Collins, Str: Nat J McDonald, Cox: J (Sid) Hellings. Average weight 11st 6lb. This was one of more interesting Interstate Championship races ever rowed. It was raced in rough conditions. Queensland started well taking the lead from the other two states. NSW was swamped half way through the race and withdrew. Victoria then started working their way through the Queensland lead but was repelled by Queensland who maintained a two length lead. About a quarter of a mile from the finish, Queensland was hit with a significant wash from a passing steamer and the two seat blade was snapped. To minimize the impact of carrying him, the two man jumped overboard. The Victorians made the best of the situation surviving the wash and passed the Queensland crew.